Can it be Verranid? Bet you a billion it’s reptilian! 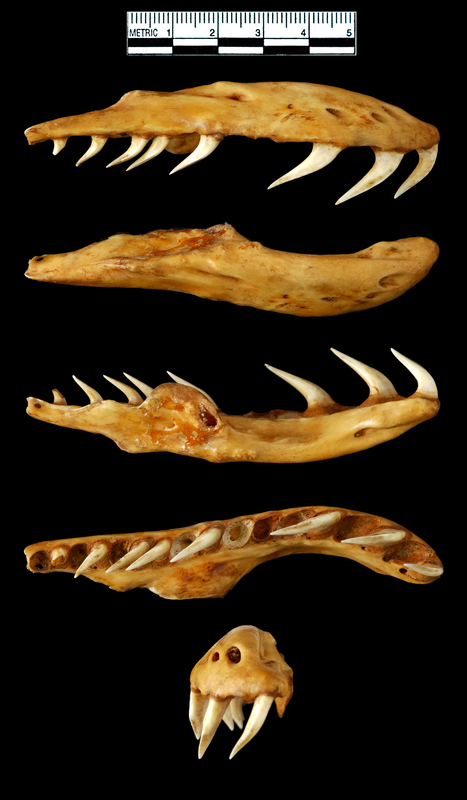 Could those be small groves in the teeth indicating a rare venomous lizard- Gila monster? Is it an African viper of some sort? The teeth don’t appear to be Solenoglyphous, so nope. Is it a Burmese python? it does look like it should belong to a python with those backwards pointing teeth but there don’t seem to be enough teeth? Is this one side of a lower jaw? It’s definitely primitive reptile but difficult to tell without the whole jaw and skull. I’d hedge my bets on Python. I think it`s some species of a constrictor snake. I checked the shape against a Boa constrictor and it’s not one of them. Looks to me like the maxilla of a primitive snake with aglyphous teeth, possibly a python or a boa. Finding it difficult to narrow it down any further than that. Is it broken off at the back? It looks a little short to be something like a reticulated python or a boa constrictor, but could be if it’s broken. I can’t tell them apart from just the one bone. Great observations! Not broken, just disconnected at the usual suture point. I would add that it isn’t particularly short! This one is putting the squeeze on my brain….hey, it’s Friday…I’m going with B.c. Having checked against B.c. I’m afraid not. Close though! This is fun to look at for a dental hygienist….my first gut instinct is to guess some sort of deep-sea toothy fish. After reading the other comments (and having no experience in identifying pieces of skull other than human) reptiles seem like a good answer. I’ll look forward to future mystery objects that you post! Thanks for sharing. A toothy fish is not a bad attempt. Similar to an Anglerfish or Moray Eel in some respects. But it’s definitely in the reptile region. Hmm It’s a right maxilla from a constrictor snake and if it’s not Boa.. I wonder if it’s somewhat related to that monster who try to eat Jennifer Lopez on that awful ’97 movie. A maxilla +9 cm long is for a really big bite! Certainly big, but I don’t think it’s quite the right shape for an Anaconda.